My kingdom for a deli! If you are Jewish and not a vegetarian and you gaze at this photo and don’t start salivating uncontrollably, then you probably don’t have a pulse either. As I wrote during Passover, I’m not much of a Jew in religious terms. But damn! I read an article today in the New York Times that stirred something Jewish deep inside of me. Can the Jewish Deli Be Reformed? Excuse me, but what exactly is indifferent meat? 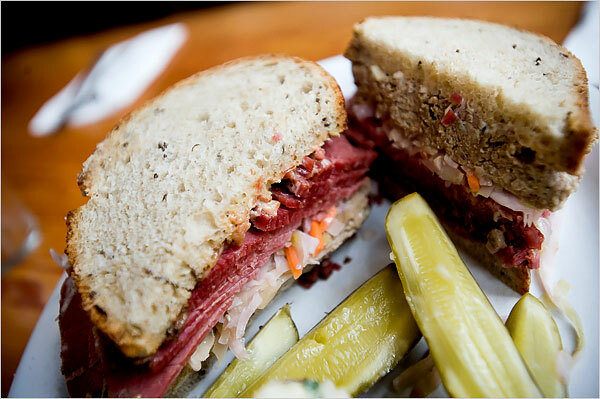 I don’t know about this revolution in Jewish delis, because I do know that one of the positives of having been raised Jewish is having been introduced to the joys of a corned beef, pastrami, cole slaw, and Russian dressing on rye bread sandwich, with a crisp kosher pickle on the side. There is NOTHING indifferent about that! Bellingham does not have a Jewish deli, and I’ve been living here long enough (17 years), so thoroughly distracted by the magnificent natural beauty, dynamic community, a family, and a career that I’d managed to completely forget the waves of pleasure that would course through my body at the first bite into that sandwich and the pickle chaser. But one read through that Times article and a look at the accompanying photos brought it all back, and I feel the loss from every day of every week of every month and of every year that I’ve been without this food of my people. Since Shakespeare’s been on my mind lately, let me put it this way: If Richard III was Jewish and had been deprived of corned beef and pastrami and pickles for 17 years, while he might have been concerned that justice was closing in on him in the battle of Bosworth Field, he absolutely would have given his kingdom for a deli rather than a horse.